Benefits: Peppermint is one of the best oils for all types of digestive upsets and should be used in massage blends, gently massaging over the abdomen. Drinking peppermint tea at the same time creates a harmonious synergy between the two forms of peppermint. 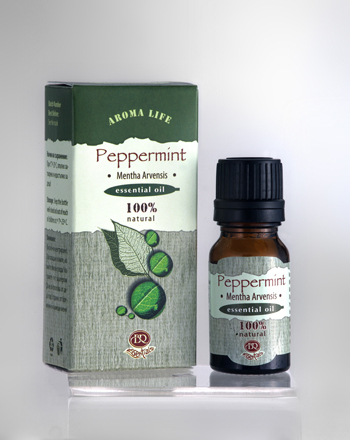 Overall, peppermint is refreshing, stimulating and restorative. Combined with lavender, peppermint helps prevent cold and flu, calms down infections of the respiratory tract (bronchitis, couth). It helps relax the nervous tension and lower the blood pressure. It has antiseptic, anti-inflammatory and antispasmodic effects and increases the resistance strength of the organism. Relieves headache, migraines, mental fatigue, bad concentration, sinusitis, heartbeat, toothache, gallstones, rheumatism and painful menstruation. Peppermint is also good in facial steam to deeply cleanse and decongest the skin, especially if acne is present. Psychologically, peppermint promotes clarity and alertness, it helps alleviate feelings of inferiority and insecurity and can deepen intuitive inside. Blends well with eucalyptus, lavender, marjoram, lemon and rosemary. Attention: Contradicted to epileptics, pregnant women and nursing mothers, children under 3 years old and people with individual intolerance to peppermint oil.